In the movie Practical Magic, Sally and Gillian Owens live under the shadow of a centuries old curse cast by their ancestor, Maria. Disappointed in love, Maria casts a spell that she would never fall in love again. Proving, however, that she who practices the Craft on herself has a fool for a client, the curse goes awry and poisons the love life of every Owens woman since. The true love of an Owens woman dies an untimely death. We don’t know a lot about Sally and Gillian’s parents, except that true to the curse, their father dies – and their mother does as well, when the girls are young … “from a broken heart.” Thus, the girls are sent to live with their eccentric aunts, Frances and Jet, practicing witches, who raise them with equal parts magical training and free-spirited thinking, where they have chocolate cake for breakfast and never have to brush their teeth. The price, however, for this magical childhood is steep, and Sally especially feels keenly the ostracisms of the people of the small town where they live. With the abiding pain of losing her parents and the social isolation caused by her birthright, Sally decides to cast a spell so she could never really fall in love, choosing an impossible combination of traits that no man could have. What a truly brilliant post, Beth! Magnificent! HI! I love this post! I’m a Pluto in Scorpio in the 8th house on the 8th degree! Pluto opposes my Taurus sun. I remembered watching Practical Magic in theater, and til this day I still get creeped out about a ‘red’ moon or a moon with a ‘circle’ around it. What is a difference between, lets say, Pluto in the 8th house versus sun in the 8th house? The blood on the moon thing, for people who don’t know, meant the the moon was in the process of a full lunar eclipse which does portend in a broad sense death and regeneration, eighth house themes. Many different myths are associated with an eclipse; and the stories follow the theme of a life and death struggle that usually have a positive outcome. I would think that an eighth house sun is a sun with a Scorpionic or Plutonic edge to it. Imagine a Gemini with the need to know, every single thing, down to the last detail, or an Aquarian who has to master every single last electronic mystery. Scary isn’t it? I’m just kidding here. Seriously Pluto represents your soul’s mission while your Sun represents the engine that drives your personality. So the difference is the drives of the soul vs. the drives of the ego which do not always agree. Thank you for posting this! I have a Scorpio moon/pluto in the 8th house and this makes a lot of sense. I always feel this weird energy that there is this deep veil that is covering what is really going on sometimes, not just in a universal sense, more so with everyone I personally know. And because of this, I usually avoid letting people in on the truth, no pun intended, but it would scare them to death. When I counsel clients with this type of energy, there is usually a sigh, and then realization that they are understood and that they are not alone. They still want their secrets, but to know that at least 2% of the humans walking the earth have the same experience as them is comforting. This movie is amazing. I’ve been a huge Nicole fan. To add up Sandra was amazing. Great article. Truly informative. I love this movie! I actually have a thing for movies and shows about witches, very interesting. I have Scorpio on my 8th house cusp with sun, Pluto and mercury inside but in early Sagittarius. My natal Pluto is RX in 9th House Libra, and I have North Node conjunct Saturn Rx in Virgo 8th House. 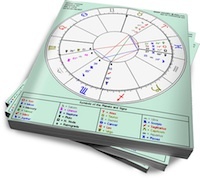 Ruler of 8th, Mercury is in 2nd House Pisces conjunct South Node, along with Sun.